On April 12 at the University of Tennessee at Knoxville, Taylor Morris (C’16) competed in both the Mixed Epee and the D and under Epee tournaments. There were 21 competitors in the first tournament, including two A fencers, one B fencer, four C fencers, two D fencers, and one E fencer. With such a strong turnout, the competition was difficult, but Morris showed excellent form as he was seeded 14th entering direct eliminations (DE). Winning the first bout in DEs, Morris advanced to the next round and was set to fence the 3rd seed who was an A ranked fencer. The bout went back and forth, but the ranked fencers greater experience won the match in the end. Morris finished in 14th place, a good result considering all the ranked fencers who participated in the tournament. The second Epee tournament in which Morris competed only allowed D and under fencers to participate, but two ranked fencers, both Ds, did compete. In pool bouts, Morris showed excellent form and beat all but one of the fencers in his pool. 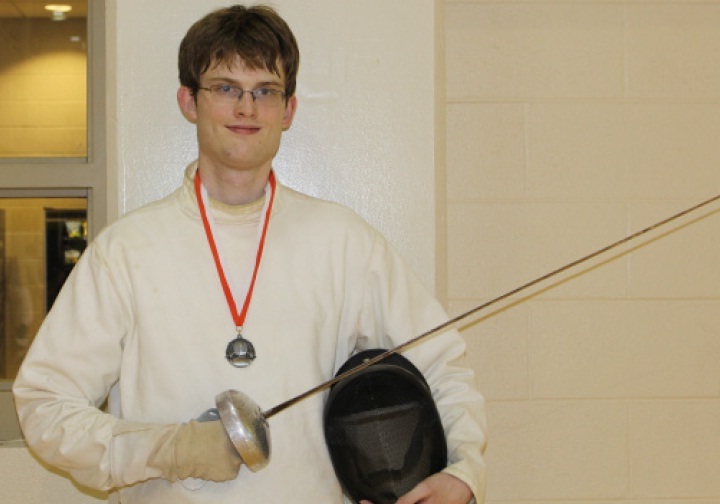 The fencer who beat him in pools, Jarrod Sargent from the Virginia Tech Fencing Club, also was one of the ranked fencers, but Morris kept the match close, forcing Sargent to win by only one point. Sargent only received six touches in pools, and four of those touches were from Morris. The success and skill he showed in pools seeded Morris in the 5th seat entering DEs. Fencing his way from bout to bout, Morris successfully won every bout until the final match for first place, when he once again had to fence Sargent. DEs require fifteen points to win and Morris started off to a good start, successfully getting several touches on Sargent. Both fencers traded touches, but finally Sargent found a weak spot in Morris’ defense and repeatedly hit him in his arm. The match was well-fought and Morris showed how much he has improved in this semester alone.